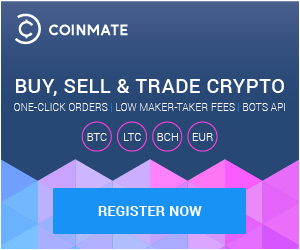 You can enjoy more automated trading without any need to establish complicated API connection to Coinmate. Even for basic daily usage, you can now place orders that will wait for your desired market value drop for you. And as the name suggests, prevent your funds from market downs. And how does the Stop-loss order actually work? It is similar to standard market order, but with a price below the exchange rate. Let’s say the current exchange rate is 10 EUR/BTC (good one, isn’t it? 🙂 ), if you’d set a sell order on 9 EUR/BTC, it would be marketed immediately. But you can use the Limit+stop button now, setting the same order this way will market your order only under the condition the exchange rate falls at the set value. The most standard usage of this method is buying assets, and then setting the stop-loss order on a price you are willing to sell it at best if the market falls. This way protects you from losing money during fast market changes. The exchange rate set up must be always lower than the current one due to the nature of this type of order. But we did not stop at stop-loss. If you wonder what does the small checkbox “hidden” do, it creates an order that no other user sees on the market. Meaning you can put up a large order without changing the exchange rate by it. Pretty useful, isn’t it? There is one condition about going stealth, the hidden order is always subject to Taker fee. So, what do you think about these news? Let us know how you like it, and of course what should we do next.